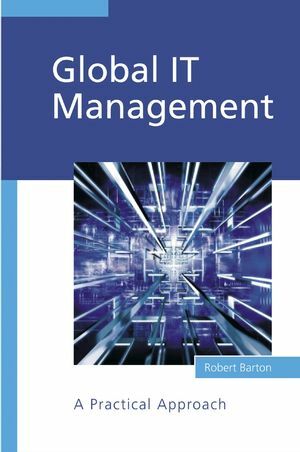 Global IT Management presents a practical approach for initiating and reinforcing global IT, focusing on the mechanisms that need to be put in place to effectively manage IT architecture, strategy, standards, and control across sites in a multinational firm. Key considerations are explained for each domain together with concrete recommendations for core organisation, processes and deliverables. The approach fits cleanly into established best practices for IT such as the CobiT® framework for IT management, and is a valuable resource for students studying IT management on MBA and Executive MBA courses. Educated at Cambridge University and INSEAD, Robert Barton is now an independent IT consultant with extensive professional IT experience throughout Europe, including three years as Head of Global IT Strategy, Architecture and Standards at the leading global pharmaceuticals corporation, Novartis Pharma. 1. Why globalize IT management? Two sides to a coin. Implementing balanced scorecards for IT. 7. Value of Global IT Management—Tested. Appendix: Positioning with established best practices.